No. 15 & 15A, Lorong Raja Nong 18A, Off Jalan Penghulu Abu Bakar, Taman Bunga Raya, 41000 Klang, Selangor, Malaysia. RPS Traders Sdn. Bhd. was incorporated in year 2011. 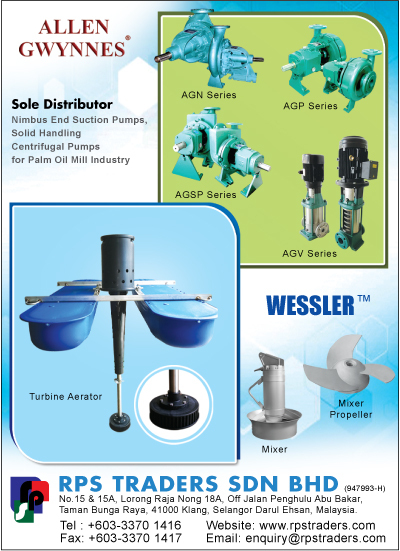 We are the sole distributor for ALLEN GWYNNES End Suction Pumps for Palm Oil Mill Industry. Our teams have the wide expose and experiences in the similar industries for more than 10 years. And with our networks of contacts for both customers and suppliers, the company has a very good potential as demand for pumps distributor in Malaysia and overseas. Our main products is centrifugal end suction pump and gear reducer which handling Palm Oil Mills , Foods and Beverage , Waste Water & Others . Others than that, we also supplying Multistage Pumps, Plate Magnet , Vibratory Feeders , Remeshing, flowmeters. As for the future development program of company, we are strengthening on the policy of customer services and after sales services by keeping stocks, spare parts and a team of sales engineering personnel support.